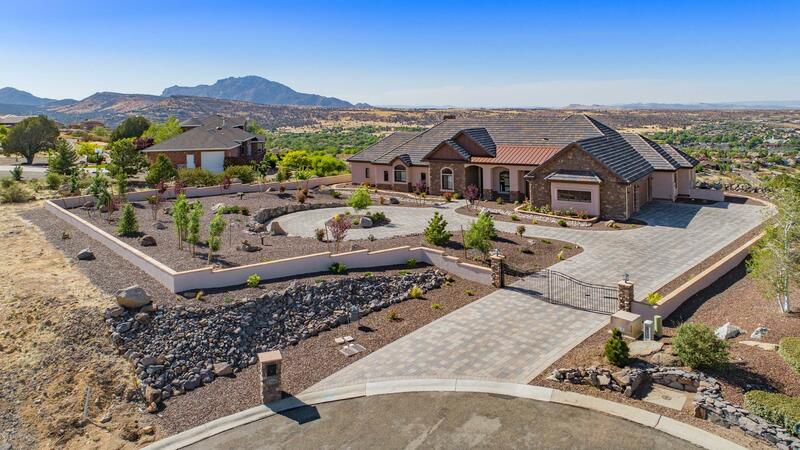 A custom designed home with panoramic views from Granite Mountain to Mingus Mountains & showcasing artistic sunrises & ends with painterly sunsets that can be enjoyed while relaxing around a gas fire pit. Set back from street at end of cul de sac providing privacy, tranquility in park-like setting with nearly 30 trees, sits a custom-built, single-story home featuring a gourmet kitchen with Viking and Sub-Zero products, including 2 dishwashers, 2-temp controlled wine coolers. Elegant dark wood floors complement knotty alder cabinets & shelves throughout. Library offers sophisticated elegance with attached lair. Split floor plan gives guests privacy & comfort. Great rm looks over Bill Williams Mountain range & San Francisco Peaks in Flagstaff. Oversized 3-car has epoxy flooring.